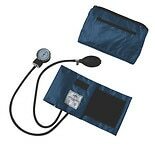 Find a reliable, accurate sphygmomanometer among our selection here at Walgreens.com. There are children's, infant and adult sizes, as well as a cuff that fits around the thigh. You can choose the color and features you prefer to get a blood pressure monitor that meets your needs and your style. 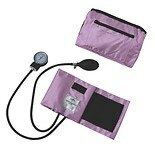 Select a sphygmomanometer from Veridian Healthcare or other brands to use in your profession. Sphygmomanometers are available with different features. If you use it daily, you'll want a model designed to withstand everyday use. Look for one that is made of sturdier materials and can be calibrated. 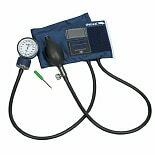 If you aren't using a sphygmomanometer each day, you can find a more economical model that is just as reliable. 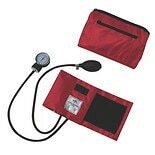 There are also kits available for medical professionals that include a blood pressure cuff and stethoscope. Digital blood pressure monitors are available for both upper arm and wrist measurement. 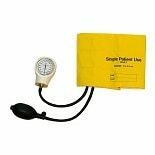 No matter which type of blood pressure monitor you choose, make sure you choose a cuff size that will provide a good fit to ensure accurate results. You can also take care of yourself or your patient with other heart health solutions. Follow doctor's recommendations and browse our vitamins and supplements for fish oil, flax seed oil and omega supplements that may help heart health.